Knowledge@Wharton: Many people or companies assume that best practices are good for a firm. Can you explain why that’s not always the case? Geoff Tuff: No, it isn’t. There’s a good reason why best practices exist. For many, many years, people learned the lessons of their forebearers as the way to operate their businesses, whether they were generally in an industry or within any specific company. When things don’t change that quickly, when things change on a linear basis and you can predict the way that things are likely to turn out in the future, that’s completely fine. Doing the things that people have done before actually is a good way of being successful. However, when change accelerates and we can no longer rely on the lessons of the past to do things well, that’s where best practices become really dangerous. The great fallacy about best practices is that they can somehow create some competitive advantage. But if everyone is following best practices, there is no advantage there. Best practices don’t become best, they become average. Knowledge@Wharton: Why write this book now? Steven Goldbach: If you speak to every executive, as Geoff and I do often in the marketplace, you’ll hear them say that the pace of change is faster than ever, and the root cause of that is the development of technology that is obfuscating business models that have worked in the past. Therefore, the vicious cycle that Geoff and I see is that … we want to apply the things that we’ve learned in the past. However, if you believe the world will be different in the future, then those lessons no longer apply. We need to come up with something new that will work in the future. What Geoff and I want people to do is to go back to the first principles of business, the ability to understand consumer behavior, and test things out in the marketplace as the thrust, rather than what’s been done before. Knowledge@Wharton: Companies often get into a pattern of how they do business, and that can really hurt the operation, correct? Goldbach: Yes. The classic example of that is Blockbuster, which defined its business as not being in the DVD delivery-to-home market and said, “We’re in the store business.” Of course, the store business became not relevant anymore. The key thing that executives need to do is go back to those first principles. What is it that your customers want to do? Always understand what’s driving their behavior. We see the same tendency in shopping today, where a lot of retailers are trying to address the challenges with e-commerce by making their stores modestly more attractive. We would say that they’ve got to go back to [the question]: What is the consumer deciding between? They’re deciding between going to the store or not, and not a modestly better shopping experience. Knowledge@Wharton: Doesn’t success often lead to complacency? Tuff: At the organization level, yes. I think everyone is able to rest on their laurels when they have been successful. Interestingly, I think the most successful businesses out there are the places where we see best practices most locked up. However, there is a really important individual element here, where each of us operating in big companies are trying to optimize for our own personal outcomes. That makes taking personal risks feel really dangerous. The best way to protect ourselves and to advance in our careers is to follow what our mentors have done in the past — to do what the playbooks say. Perversely, when you get a bad outcome by following those playbooks, instead of saying, “Well, that didn’t work. Maybe I should try something different,” people just adhere ever more closely to the playbooks and get even worse outcomes. That’s the vicious cycle that we describe in the book, which actually is as much about personal risk-taking as it is organization risk-taking. Knowledge@Wharton: In the book’s title, you include the parenthetical words “a beginner’s mind.” Why is that perspective necessary in order to make changes? Tuff: The No. 1 attribute is curiosity. The notion of beginner’s mind, which is something that’s spoken about in a lot of business circles these days, comes originally from Zen Buddhism. There’s a famous quote in Zen Mind, Beginner’s Mind by Shunryu Suzuki that’s something along the lines of, “In the beginner’s mind, there are many options. In the expert’s mind, there are few.” What we’re challenging companies to do today is not to bring an expert’s mind to the table, not to presume that we know the way things will operate, we know the way our markets will unfold, we know the way our competitors will react if we do certain things. Instead, look at things afresh, which is exactly what entrepreneurs do when they try to bring a new, disruptive business model to an industry. 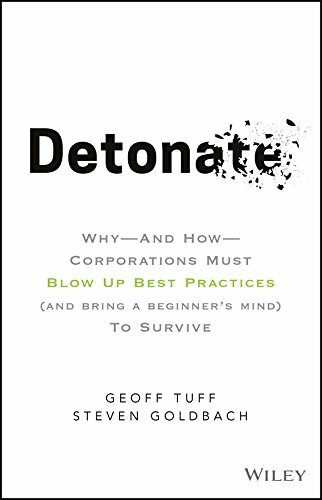 Knowledge@Wharton: Is “detonate” part of that mindset as well? Goldbach: Yes. What we want leaders to do is to think differently and act differently. One way they would think differently is by doing exactly what Geoff said, bringing a fresh perspective, bringing that beginner’s mind. The other thing they could do is be really curious about what is driving their customers’ behavior. It’s that focus on behavior that is the most basic element of business, that has the root insights of what they could do differently than their competition. Then they’ve got to act differently by making what we call minimally viable moves, which is trying something out and seeing if it works. Because again, if you want to do something that’s never been done before, you’ve got to try it out a little bit to see if it works. Embracing impermanence is also important. In a world that’s moving so quickly, you can’t get too wedded to any single structure or system or process that creates that same vicious cycle all over again. You’ve got to be willing to walk away from something that has perhaps worked for a while, even if it was successful. Knowledge@Wharton: How much of that quandary is amplified by digitization? Goldbach: I think the issue is really about the reinvention of business models. You see that happening with companies like Uber, which disrupted the taxi business and is incessantly trying to disrupt itself with investments in autonomous vehicles. This is a classic example where companies need to be restless, where they know that the business model of today won’t necessary apply in the future. Knowledge@Wharton: One of the examples in the book is Canadian fast-food chain Tim Horton’s. What is the lesson about that company’s success? Tuff: The basic lesson that we brought from Tim Horton’s into the book — and I generalize it beyond that restaurant to others — is that they didn’t assume the way things that had happened in the past would continue to unfold in the future. The rate of opening new stores in different locations is not the way that they approached their forecast looking forward. The story we tell in the book — and it’s a story that I’ll attribute to my friend and co-author here — was that as we were helping think through this challenge, we made a mistake in looking at past data as a way to project what was going to happen in the future. With them, we were able to work towards a better outcome and great growth for the company because we were able to catch ourselves before that became too disastrous a projection. Goldbach: One of the things that they did was they reimagined what a store meant. They had declared that they would have 2,000 stores by 2000. If you looked at any conventional way to get there, the market was just saturated. But they reimagined what a store would look like. They were the ones that came up with the doughnut-store-in-the-gas-station concept and opening them in different kiosks. Knowledge@Wharton: What is your view of revenue? Goldbach: I think the most important thing is that revenues are an outcome, not an input. What we talk about in the book is that when companies do their financial forecasting, they often treat revenue as if it’s a given … rather than the opposite. They start by saying, “How much is the market going grow over the next five years? What’s our fair share of that? How much profit do we want to make? How much can we afford to spend to generate that revenue?” Of course, the world works in literally the opposite way. What we’re saying in the book is not that revenue isn’t important. Rather, it’s an outcome of spending your costs in order to change customer behavior to drive revenue. If companies understood that they have to literally start from zero every year and earn it, they would be less susceptible to disruptive forces. Knowledge@Wharton: How should companies think about strategic planning? Should they not rely on that as much as they move forward? Tuff: We absolutely are supporters of strategic planning, but it does need to be approached differently. First of all, strategic planning shouldn’t be attached to an annual calendar. Strategy should actually mirror the way that people in our markets are behaving and the way our markets are unfolding. For some companies, strategy should be revisited every quarter, for example. That sounds like a daunting effort. It doesn’t need to be a complete redo. But for other companies in other industries, it’s something that can be on a three-year or five-year cycle. One of the things that colleagues of ours talk about is the “zoom out, zoom in” approach to strategy planning. That’s where we no longer assume that we can make good predictions about what’s going happen in the next two to three years because we are in this state of exponential change. Instead, we can imagine a future using scenario planning. We can imagine a future 15, 20 years out and say, “If that’s going to be the place where we end up, what do we critically need to do in the next few months?” That’s what we’re starting to see some of the best strategic planners out there beginning to do. Knowledge@Wharton: What approach do business leaders need to take to get on this path? Goldbach: We see leaders often unintentionally reinforce either best practices or past behaviors by the nature of the questions that they ask. They ask their people to prove things that haven’t been done before by either asking questions like, “Tell me what’s the return on investment?” It’s not that we’re saying that return on investment is a bad concept. But asking the person pitching an idea to tell precisely what the return on that idea will be is causing that person to assume all the risk associated with that project and prove something that’s never been done before. Think about leaders asking slightly different questions that elicit a learning mentality, that elicit a testing mentality by saying, “What would have to happen for us to generate a positive return? What do we think our customers might do? How might they react? How might we test this in a small way?” They can elicit those different behaviors and start to transition the mindset of their organization. I think that’s the place where we would recommend that leaders start. Knowledge@Wharton: How does that filter down to the employees? Tuff: We talk in the book about the various mindsets associated with being able to detonate. We’ve argued that it has to happen both at the top of the house, where you’re given clearance to think and do things differently, but it’s also the responsibility of everyone down through middle management to the average employee. Of the four principles that Steve talked about before, when people ask us, “Which one is most important, and how can we really start to make changes immediately as individuals within an organization?” the one that we talk about that probably has the most impact is to start everything with human behavior. Steve talked before about the criticality of human behavior as being the most basic economic unit of analysis of any company. What we mean by that is, you cannot change your performance curve until someone, somewhere changes their behavior. If we can aim our planning and execution resources at understanding the behaviors in our whole business system that have the most economic value, and then invest disproportionately in making those happen, we will end up succeeding as a company. But the problem is that a lot of employees, a lot of middle management, don’t think that way. They think about the processes they have to run, about the reports they have to generate. Knowledge@Wharton: Sometimes ideas do not succeed, and there is pushback against failure. That negative reaction can cause the turtle to go back into the shell a little bit, so you don’t get progress. Goldbach: Geoff and I had some really fun arguments about this notion about celebrating failure. One of the things that we would eradicate in the lexicon of leadership is this idea that failure should be celebrated. Failure is not something that anybody wants to have happen. But we need to make sure that we define failure very carefully. It’s not being wrong about your hypothesis about a business model or a customer value proposition or customer behavior. Failure is spending way more than you needed to spend in order to discover that. The idea of putting something out there in a big way to be bold — we would say, figure out the minimally viable move that you can make so that failure becomes not as big of a deal, that doesn’t cause the turtle to crawl back into its shell. You make it OK to learn and adjust as you move forward. But when failure becomes the egg on your face, and someone’s blamed for stuff, that will cause people to start to go back to some of those behaviors.